Rajasthani cuisine is well-known across India for its richness and abundance of spice. Its desert location plays a huge part in its food scene, with cured, pickled and dried foods all popular. Dairy products are also common, with milk, cream and yoghurt used to flavour and thicken curries and gravies. 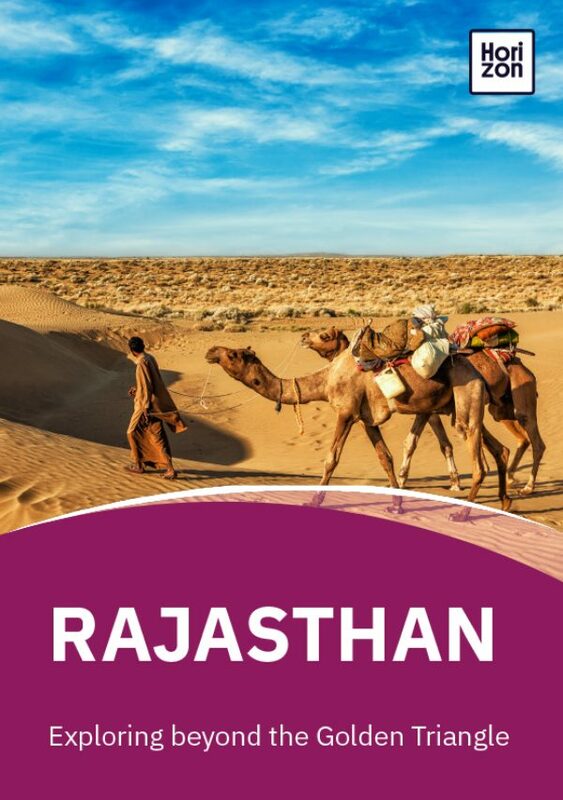 Despite the harsh conditions, Rajasthan’s royal background means that meat was often consumed, so you’ll find many great meat and vegetarian options. Traditional Rajasthani cuisine is often quite spicy, as chilli was used to preserve and cure food. Try laal maas (mutton curry), Rajasthani kadhi (dumplings in a spicy sauce) and the ubiquitous dhal bhati churma (a wheat bread stuffed with peas and onions, then dipped in ghee and served with dhal). Don’t miss out on some of Rajasthan’s street food. Make sure to pick a stall that is popular with locals and looks clean. Try kacchori (deep fried dumplings), samosas and full thalis (set meals containing curried vegetables, dhal, pickles, rice and bread). No meal in India is complete without a supply of roti (unleavened flatbreads) to mop up the food. Try bhakri, a roti made from millet or corn and eaten with garlic, chilli and raw onions -- locals believe it wards off sunstroke. For more substantial breads, try buttery parathas (flaky, pastry-like discs of bread) and doughy naans. 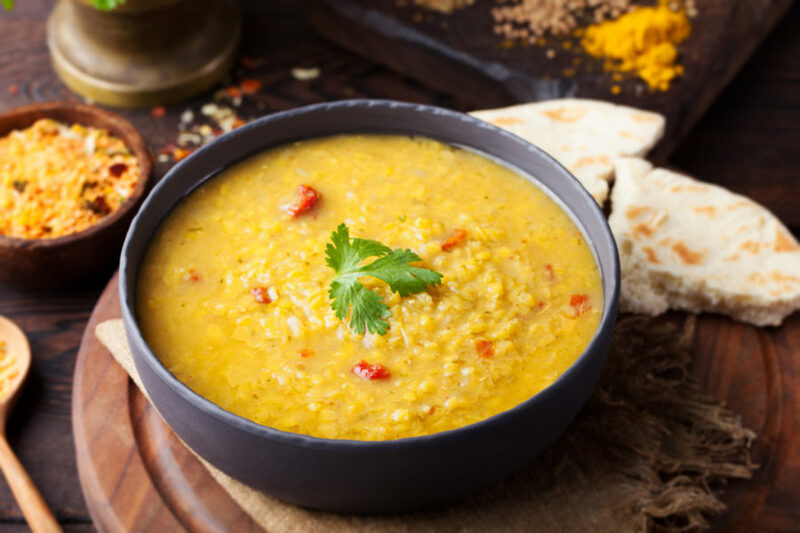 India has more than 50 different varieties of dhal, but Rajasthan’s most popular is the afore-mentioned dhal bhatia churma and urad dhal (black lentils cooked with garam masala, chilli, cumin and coriander). When in Jodhpur, try kabuli Jodhpuri, a local speciality made of fried gram flour dumplings, vegetables and sometimes meat. Most fried street-food snacks are made with gram flour, such as the ubiquitous pakoras. Chicken, goat and mutton are all commonly eaten in Rajasthan, while religious taboos mean beef (forbidden to Hindus) and pork (forbidden to Muslims) are unlikely to be found. Many meat dishes in Rajasthan are cooked with dairy rather than water, with buttermilk, ghee and curds all being used to preserve the meat -- perfect for desert conditions. Try achar murg (pickled chicken), kachar maas (a dry dish of lamb cooked in spices) and laal maas (mutton curry in a deep red sauce). The harsh climate conditions means that Rajasthanis have had to be inventive when it comes to fruit and vegetables. Try aloo gobi (dry cauliflower and potato cooked with spices) or mattar paneer (a mild curry of peas and firm cheese). Look out for fruits special to the region, such as kair, a berry eaten with desert beans -- it tastes better than it sounds. You’ll also find many vegetables pickled or cured in chutneys. Each meal will come with an assortment to try. Indian desserts are incredibly sweet and Rajasthan’s are no exception. Try badam barfi, an achingly sweet concoction of sugar, milk, butter and nuts; gulab jamun (deep-fried sponge balls swimming in rose-flavoured syrup) and kheer (a rice pudding flavoured with cardamom, saffron and nuts). The Indian summer can be cruel, with hot winds blowing in from the Thar Desert forcing temperatures above 40C. It’s important to stay hydrated while in Rajasthan, but it also allows you to sample some of the state’s more creative thirst quenchers. Try nimbu shikanji, a lemonade style drink made with fresh lemons and black rock salt; bael juice, made from the pulp of the wood apple and mixed with jaggery and salt; and chaach, a buttermilk drink served with salt and cumin.